What do you see in the picture? 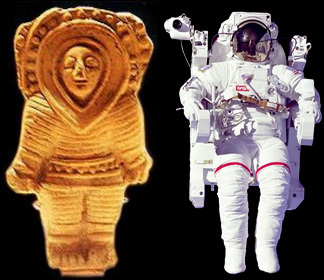 Do you see an ancient figure and the image of an astronaut? Or do you see two figures that have undisputable similarities? Two figures that despite the separation of time and geography look so alike that one can only assume they derive from a common source? Thus begins AntiquityNOW’s exploration into the marvelous and imaginative world of science fiction. AntiquityNOW uncovers the common linkages between the ancient and modern worlds—and mystery has been at the heart of the human condition from time immemorial. The mystery of survival, of fate, of life itself. The imagination has been the instrument for shaping cultural identity by giving meaning to these mysteries. Humankind through the centuries and spanning continents and seas has woven a tapestry of mythologies and histories that still mystify, confound and resonate today. These age old motifs find fertile ground in the literary genre of science fiction. Don’t get us wrong. We like scientific inquiry. We deeply value research. But who really wants to refuse a magical carpet ride? So travel with us into a world of illusion and science. Take that first step into the great unknown. That frisson of fear, the gasp at the phantasmagorical, the conjuring of primal emotions …you’re in the right place. Suspend logic and let your imagination soar.